"Money and the Commons: An Investigation of Complementary Currencies and their Ethical Implications"
The Warren Samuels Prize is awarded by the Association for Social Economics (ASE) to a paper, presented at the Allied Social Science Associations (ASSA) Meetings, that best exemplifies scholarly work that is of high quality, is important to the project of social economics, and has broad appeal across disciplines. The rewarded article (https://ideas.repec.org/p/sol/wpaper/2013-280911.html) evaluates how subsidies affect the cost-efficiency of microfinance institutions (MFIs) while accounting for endogenous self-selection into the business models of credit-only versus credit-plus-deposit MFIs. The findings suggest that unsubsidized credit-plus-deposit MFIs have achieved optimal capacity and therefore constitute the most cost-efficient group of institutions. In addition, the unsubsidized credit-only MFIs are the farthest away from their minimum cost. Between the two polar cases, there are subsidized institutions, among which the credit-only ones are closer to optimal capacity. The results reveal the redundancy between subsidization and deposit-taking in microfinance. Combining funds from donors and depositors tends to harm cost-efficiency. 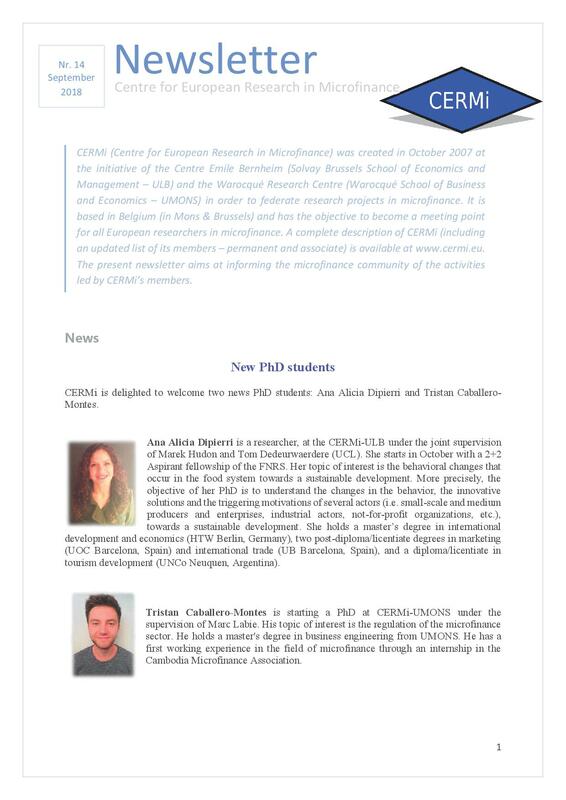 Discover our 14th CERMi Newsletter (September 2018)! 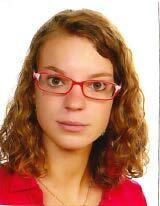 Cécile Godfroid, CERMi PhD student, will publicly defend her PhD thesis on August 31, 2018, at 3.30pm at the University of Mons (UMONS). The defense will be held in room Hotyat. CERMi (Centre Européen de Recherche en Microfinance / Centre for European Research in Microfinance), draws together researchers, involved in microfinance activities in developing countries, from the Centre Emile Bernheim (Solvay Brussels School of Economics and Management, Université Libre de Bruxelles) and from the Warocqué Research Centre (Université de Mons). The CERMi also collaborates with the European Microfinance Programme. Microfinance provides financial services, including credit, savings and insurance, to poor customers with little or no access to the traditional banking sector. It has come to be regarded as a very important component of strategies aimed at reducing poverty. Over the last decade, the microfinance industry has experienced rapid growth creating a constant demand for new knowledge to help guide its development. 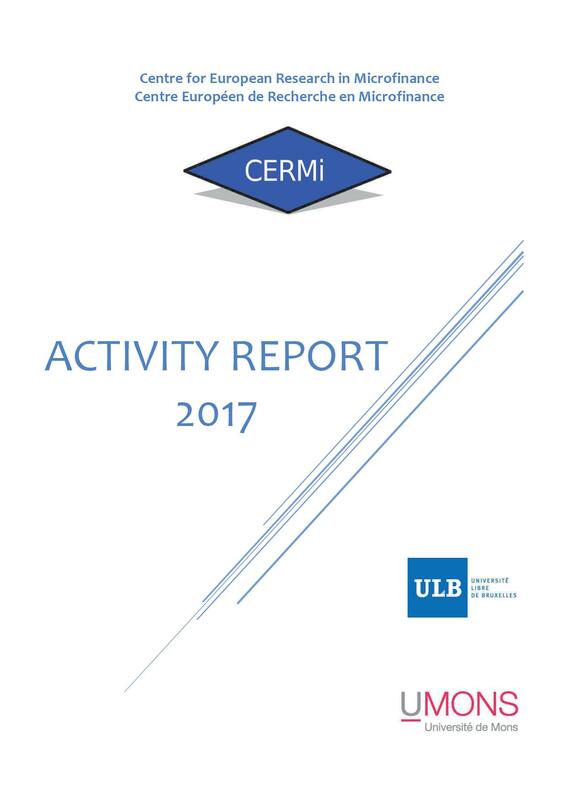 CERMi was created as part of the Académie Wallonie-Bruxelles, with the goal to become an active participant in this process. It aims to study the management of a wide range of microfinance financial institutions, represented by NGOs, cooperatives and commercial companies. Thanks to an interdisciplinary approach, CERMi hopes to make substantive contributions to the body of knowledge on microfinance which will help the industry deal more effectively with its future challenges.